Adapted from "Television in the World of Tomorrow", by Iain Baird, ECHOES, Winter, 1997. Copyright Echoes Magazine, 1997 & Iain Baird, 1997-2000. Images courtesy NBC, David Sarnoff Research Center. Regular television broadcasting in the U.K. had been available since 1929 using BBC transmitters on the Baird 30-line mechanical system. Although the pictures were low-resolution, viewership numbered in the thousands. After these broadcasts were shut down in 1935, electronic television on the 405-line EMI-Marconi all-electronic system was chosen by the Selsdon committee to succeed the 30-line system. By November 1936, the BBC was conducting regular, high-resolution television broadcasts on the 405-line standard. This contrasted with the North American situation. Charles Francis Jenkins' Radiovision broadcasts were popular and thousands of enthusiasts built kits, however it was mostly done in the name of experimentation. The Radiovision pictures were electro-mechanical in nature, and used technology very similar to that used by Baird in Britain, but the earliest pictures were only shadowgrams and not true television. Jenkins and a handful of mechanical television companies went into full-scale electro-mechanical television (not shadowgrams, with half-tones) during the late 1920s and early 1930s having built proper Nipkow-disc or mirror-drum cameras. Sales of the deluxe mechanical television receivers were limited to extreme enthusiasts or the wealthy due to their high cost. Regular all-electronic television broadcasting was delayed until well into 1939. Many reasons can be given for the relatively slow beginnings of television in the U.S. It was certainly due in large part to the lengthy legal battle between the giant company RCA, and black-and-white electronic television's independent inventor, Philo T. Farnsworth. Farnsworth's Image Dissector camera patents were the contentious issue. RCA wanted to buy them, while Farnsworth wanted to license them. Finally, in 1939, this case was settled and American television could begin. RCA had begun to develop reliable television broadcast technology long before their legal case had been settled, and in 1939 had readied their production line to produce 4 different models of consumer TV receivers. Only one thing was needed to sell these sets... TV programs. The National Broadcasting Corporation (NBC) was RCA's broadcasting wing. It began regular U.S. television broadcasting on April 30, 1939, with a telecast of President Franklin D. Roosevelt opening the New York World's Fair. 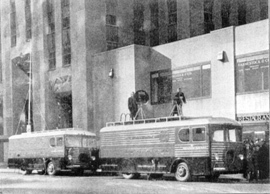 Programs were transmitted from the NBC mobile camera trucks to the main transmitter, which was connected to an aerial atop the Empire State Building. 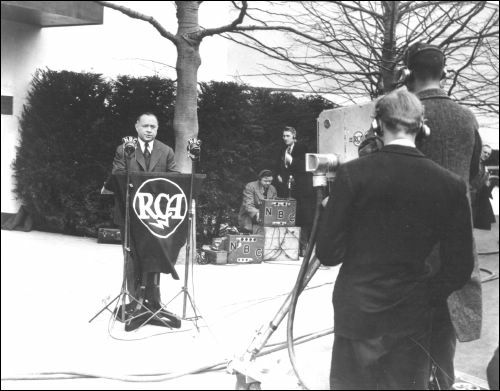 Ten days prior to Roosevelt's speech, David Sarnoff, President of the Radio Corporation of America(RCA) made the dedication speech for the opening of the RCA Pavilion at the New York World's Fair. Staging this event prior to the World's Fair opening ceremonies ensured that RCA would capture its share of the newspaper headlines. The ceremony was televised, and watched by several hundred viewers on TV receivers inside the RCA Pavilion at the fairgrounds, as well as on receivers installed on the 62nd floor of Radio City in Manhattan. Programs of 1939 included operas, cartoons, cooking demonstrations, travelogues, fashion shows, and skaters at Rockefeller Center. There were also numerous live telecasts relayed from within the fair itself. The RCA Pavilion was designed by the renowned U.S. Modernist architectural firm of Skidmore & Owings. When viewed from the air, it was shaped like a radio tube, attracting much attention since aerial views and models of the fair were immensely popular as they showed visitors the scope of the exhibition. The first sight to be seen inside the entrance of the building was a TRK-12 with a special transparent cabinet. People were amazed by the quality of the television pictures on this unit. The great majority of visitors had never seen television before, and the set's transparent cabinet removed any doubts in viewer's minds that magic or trickery was involved in obtaining the pictures. Exhibits within the RCA Pavilion dramatized the use of television in the home, and documented RCA's experimental breakthroughs. 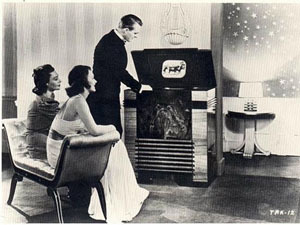 The "Radio Living Room of Tomorrow" was created by Turkish-American industrial designer John Vassos. It was outfitted with contemporary built-ins such as a combination radio/television/record player/record-recording set, a facsimile receiver, and a sound motion picture projector. To illustrate how television could be integrated into existing decor, Vassos designed a "Radio Living Room of Today". This featured period furniture complemented by separate cabinets containing the same electronic components. The RCA "Television Laboratory" exhibit featured a display of Vladimir Zworykin's experimental television camera tubes (such as Iconoscopes) and picture tubes (these tubes were often called Kinescopes). As visitors travelled further into the RCA Pavilion they could enter a "Hall of Television" which contained thirteen of RCA's finest TRK-12 receivers. These were kept operational as much as possible, to better provide visitors with an opportunity to sample the new medium. Also in this room was an experimental projection television receiver, which used a very bright five inch cathode-ray-tube and a large lens to project television pictures onto a special light-reflective screen. The pictures demonstrated with this unit are believed to have been at least three feet high by four feet wide. A large Nipper the Dog statue, that familiar dog listening to "His Master's Voice" on the RCA phonograph logo, looked on from a pedestal on the other side of the room. Visitors crowded together to watch NBC broadcasts or internal closed circuit demonstrations. Frequently, volunteers were escorted outside to the cameras and encouraged to wave at the folks inside. Television was such a novelty at the time that "I was televised" cards were handed out as a souvenir of the experience. RCA offered four types of television receivers for sale to in 1939, the TRK-12, the TRK-9, the TRK-5, and the TT-5. The TT-5 was an "everyman" vision-only table model introduced last. Their prices, ranging from U.S. $199.50 to $600, were considered high. Advertising was initially aimed at the wealthy; depicting viewers dressed in evening suits and gowns to watch TV. All RCA TV sets at this time were designed by John Vassos, with handcrafted, highly polished wood cabinets taking their cue from the newly popular "streamline" style. They received channels 1 to 5 (the frequency for channel 1 had not yet been taken over for military use). The RCA sets were offered for sale in Macy's, Bloomingdale's and Wanamaker's department stores in the New York Metropolitan area. Although shoppers were curious, television sales right up until the beginning of World War II were disappointing. Most of the unsold 1939-41 televisions were put into storage and sold after the war. Manufacturers other than RCA exhibited their television receivers at the 1939 World's Fair. In 1938, Allen B. DuMont Laboratories, established by the inventor and entrepreneur of the same name, had already offered the first electronic TV sets for sale to the public (prior to the Fair) with their 180 model. Westinghouse Electric and General Electric offered competing production lines of consumer televisions in their own pavillions. These companies also built studios with live cameras for interviews. Even Ford Motor Company got into the act, with television receivers in their executive lounge. Conspicuously missing was Farnsworth Television. Although Philo T. Farnsworth was the first to demonstrate electronic television technology in 1927, his company was not yet manufacturing commercial television receivers. 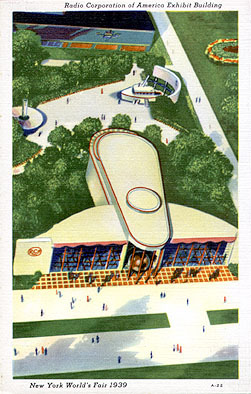 RCA's pioneering television efforts continued at the World's Fair the following year (1940). Exhibition space for the new medium was nearly doubled and the display featured "Television Suites", again designed by Vassos, showcasing the new models in 10 different American home settings. Vassos also contributed to the "America at Home" exhibition. His "Musicorner" featured indirect lighting, soundproofing, 16mm sound film projector, radio, phonograph, and television receiver all housed in bleached Mahogany modular furniture. Most of the New York World's Fair facilities were demolished in 1940-41 due to a lack of new tenants for the exhibition buildings.